Missoula’s First Friday is a decentralized event, with lots of different galleries, businesses, restaurants, coffee shops, bars and retailers participating by featuring artists. Galleries change-up their features and coordinate show openings to fall on these evenings. Then, from 5 until 8 PM, or sometimes later, they are open. Different places have a variety of snacks, drinks and free wine on offer. You can sip on a drink while you wander through. Several galleries have musicians, from one person acts, to harpists, to multi-person bands. In June 2014, there was a wandering brass band downtown! With your wine in hand, look at a huge variety of styles in the 4 Ravens Gallery, the Dana Gallery and Bhavana, which are all internally linked. Pick up a few Doritos, or snack on a Twizzzler while you take in huge portraits of horses, or the latest political commentary. Down the road at The Artists’ Shop, enjoy the changing exhibit right alongside the permanent works for sale, including absolutely stunning woodworking and cribbage boards. The real estate agencies in town get in on the action and provide beautiful spaces for featuring artists, with relaxed seating areas and beautiful large walls. The coffee shops are also in on the game, and the Missoula Housing Authority, too. There are shows on the first floors of buildings and higher up as well. Watch for sandwich boards pointing you to more little places to discover. As you wander, you will be one of hundreds coming out to take in the art scene in Missoula. The turnout is truly impressive. The Fact and Fiction book store is also known for getting in the action, having publication launch nights and author readings on First Friday. The bulk of the participating organizations are located on Higgins Avenue, or the very close side streets, but a few walkable outliers also participate. There are rack cards with participant listings available in most of the galleries. If you pick one up, most of the addresses are quite easy to find, as the streets cross over Higgins. Alternatively, you can also visit the Missoula Cultural Center website which includes a clickable map. After you have taken your fill of complimentary beverages, snack foods that are mostly destined for your waist, take a bit of a stroll down to the Clark Fork. If it is springtime, there might be people hanging out, playing music, maybe playing hacky sack and folks in the river. There is a standing wave, called Brennan’s Wave, right below the bridge on Higgins, where surfers and white water kayakers play and do tricks. Observe them from the bridge, or walk down the river path for a few blocks before circling back. Around 8 or 8:30 most places begin to wrap things up, and it’s a great time to pick a restaurant or bar to top off your evening. The Iron Horse Bar and Grill, the Old Post and the Flathead Lake Brewing Co. are all great choices, with outdoor patios or spaces available. 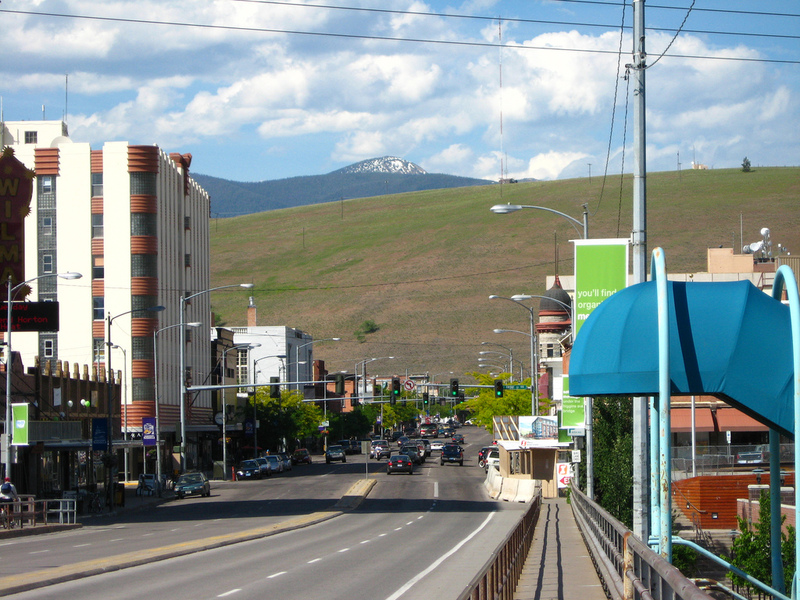 Missoula has a great arts culture and it is fun to experience in the casual and welcoming atmosphere of First Friday. Check it out the first Friday of every month of the year, in downtown Missoula, MT. That’s something great to look forward to every Friday and a good way to boost local businesses too! I remember passing by Missoula on a road trip. The whole of Montana is gorgeous! It is so much fun! I have been twice now and wish there were enough galleries to make it happen in my small town!